Cook the tortellini according to package directions and then set aside. Season the shrimp with salt and pepper and then toss with olive oil. Saute in an oven-safe skillet on medium heat for 3-5 minutes per side or until pink. Remove from the skillet and set aside. You are now done with the stove so you may shut it off. Toss the cooked tortellini with the marinara sauce and then place in the skillet. 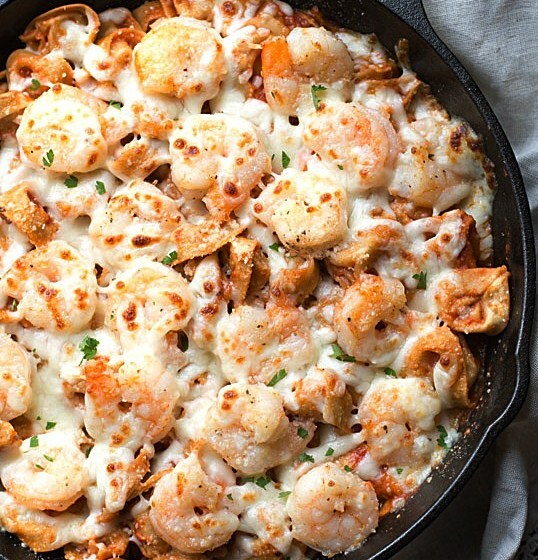 Top with the shrimp and then sprinkle with parmesan cheese and then the mozzarella cheese. Broil until the cheese is bubbly and slightly browned. Use homemade or all natural tortellini to make it healthier.